ISTANBUL (Reuters) - Turkish President Tayyip Erdogan said on Sunday those in the finance sector who buy foreign currencies on the expectation that the lira will fall will pay "a very heavy price", adding the Finance Ministry is carrying out work on this. The Turkish lira tumbled more than 4 percent against the U.S. dollar on Friday, its biggest one-day fall since a currency crisis took hold in August, raising concerns that Turks are buying more foreign cash as ties with Washington deteriorate. Central bank data showed on Thursday that forex deposits and funds including precious metals held by Turkish locals hit a record high in the week to March 15, which economists said signalled a fall in confidence in the lira. The lira stood at 5.7800 against the dollar at 2005 GMT in Asian trade, weakening from Friday's close of 5.7625. 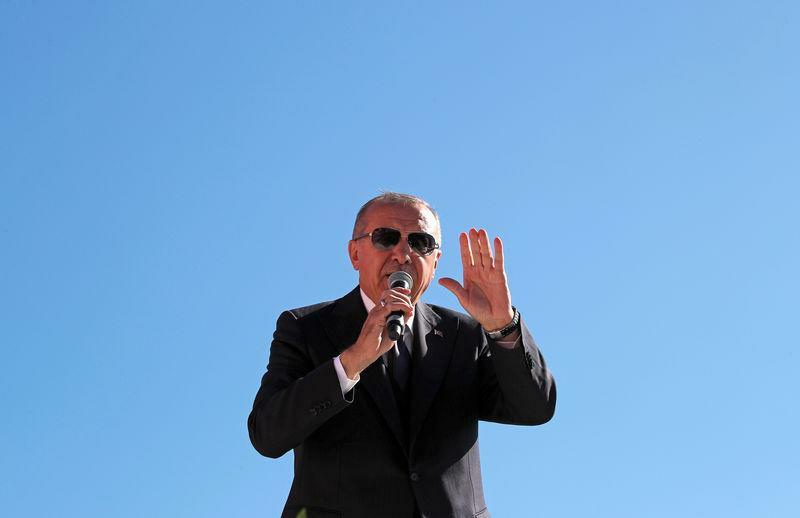 Speaking at a local election rally in Istanbul, Erdogan said "some people" had begun provoking Turkey and that they were attempting to make the lira decline against foreign currencies with their cooperators in Turkey. "I am calling on those who engage in such activities on the eve of elections, we know all of your identities. We know what all of you are doing. Know this, after the elections, we will present you with a heavy bill," he said. Turks will go to polls on March 31 for local elections. In an interview with broadcaster TGRT Haber later on Sunday, Erdogan also said Turkey would give a hard time to those in the international community behind what he called "manipulative impositions" in the FX market. Erdogan did not specify who his comments were aimed at, but on Saturday, Turkey's banking and market regulators said they had launched investigations into complaints that a JP Morgan report had caused speculation in the Istanbul bourse and hurt the reputation of banks. A JP Morgan spokesman for the region declined to comment on the investigations. The report seen by Reuters said it saw a high risk that the lira would decline after the local election, recommending clients to go "long" on the U.S. dollar. Such advice is typical of client notes from banks globally. Finance Minister Berat Albayrak said on Friday that speculators were talking down the Turkish economy on social media and that the manipulation was similar to that he said took place during anti-government protests in 2013.